This chapter illustrates some aspects of the theoretical and practical implications of TA for optimizing the profit of an entity. The main objectives of this chapter are to present a comparative analysis of the managerial implications between throughput accounting and some managerial accounting methods, hybridization attempts with other methods, as well as its advantages and limitations in the current context of implementation and profit optimization an economic entity. Based on the literature, the authors present the main approaches and the historical evolution of the throughput accounting, the principles of TA and TOC, as well as a comparative analysis between traditional accounting and TA. 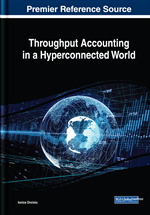 The chapter ends with the authors' conclusions on throughput accounting and its implications on management accounting methods, opening up new directions of future research aimed at highlighting various theoretical and methodological aspects encountered in academia or business environment. Over the past 40 years, new philosophies such as Throughput Accounting (TA) or Theory of Constraints (TOC) merged to create new alternatives to monitor and measure the performance of manufacturing companies. According to their historical evolution, the two approaches go from different concepts, but the specialists identified a general framework of integration and merging that opened a new stage in understanding some aspects that were later ignored in substantiating managers' decisions. Comparative analyzes at the level of implementation and implementations of the integrated framework of the two approaches have demonstrated their viability as an informational and decision support. Starting from the general framework of traditional cost accounting, the ways to create a common framework for integration and hybridization of the two approaches are presented and analyzed with some of the most discussed managerial accounting methods and techniques such as Activity-Based Costing (ABC) Direct-Costing (DC), Six Sigma, Lean Accounting. It also analyzes and presents the opinions of the specialists on the viability of their integration, the impact of the managerial implications, but also the opinions and conclusions of the authors of this chapter. The main objectives of this chapter are to: (1) identify and clarify aspects related to Throughput Accounting (TA) and Theory of Constraints (TOC); and (2) identify integrated systems of accounting for Throughput Accounting and managerial implications which involves them. Value Stream (VS): A sequence of processes through which a product follows all the steps necessary for transformation and delivery to the customer. Return on Investment (ROI): Indicator that measures the gain or loss generated by an investment relative to the amount of money invested. Mix Integer Linear Programming (MILP): Linear program where some variables are required to take whole values and occur naturally in many applications. Direct-Costing (DC): A specialized form of cost analysis that takes into account when determining the result only the variable costs and not the fixed costs that are considered as costs of the period. Six Sigma (SS): Managerial approach focused on a team that aims to improve performance by eliminating waste and defects. Improving performance and reducing process variation leads to the reduction of defects and improved profit, employee morale and product/service quality. Value Stream Costing (VSC): Process of identifying and setting costs for all stages of the process needed to deliver value to the customer. It is a function that helps determine the value created by each stage of the process. Lean Manufacturing (LM): Business management tool that focuses on reducing waste from production processes. Lean Accounting (LA): Advantage of poor production that attempts to eliminate waste from a company's capital resources by applying principles of manufacturing the company's weak financial function. Value Stream Profit and Loss (VSP&L): Lean reporting specific situation in which the return on the flow of value is provided by the flow of value less the indirect costs. Throughput Accounting (TA): Integrated system based on principles used in consolation theory (TOC) accounting for performance measurement. Activity-Based Costing (ABC): An accounting method that identifies the costs of (indirect) activities and then allocates these costs to the products. Allocation of product costs to products is done through cost drivers. Theory of Constraints (TOC): Organizational change method centered on improving profit. Philosophy is that each organization must have at least one constraint. A constraint is any factor that limits the organization from making more efforts, usually profit.